As the city of Orem prepares for its 100th anniversary in 2019, Mayor Brunst recognizes the importance of preserving historical landmarks while also investing in infrastructure for the city’s future growth and development. Nicknamed “Family City USA”, the Mayor’s recent efforts to bolster economic development and security for Orem’s 88,000+ residents have helped the city live up to its name. Recently one of these projects came to fruition when Orem became an early adopter of FirstNet by subscribing to the nation’s first broadband network dedicated exclusively to public safety emergency communication. With FirstNet in place, law enforcement, fire, EMS, public utilities and other public safety entities will experience an “always on” connection to ensure reliable communications during day-to-day operations, large-scale events and emergencies. 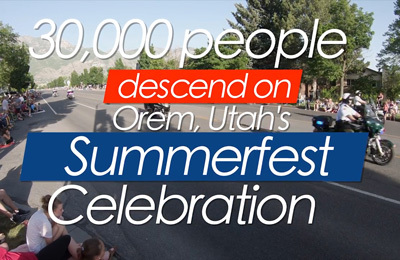 During this year’s annual Summerfest that attracted over 30,000 visitors, FirstNet was put to the test by the Orem Fire and Police Departments who patrolled the event’s parade and festivities on foot, bicycle and by car. Local first responders were outfitted with FirstNet-ready devices with push-to-talk capabilities and connected to FirstNet’s exclusive communications platform built by AT&T for public safety. At the event, first responders experienced the true difference of a superior network that kept critical information flowing and allowed for interoperable communications between local public safety disciplines. Along with priority and pre-emption and expanded coverage, the city’s police also leveraged FirstNet capabilities by connecting patrol cars to the network allowing for quicker response times and better coordinated responses to keep the event running smoothly. In the future, the City of Orem foresees the benefits of FirstNet’s robust network to help with search and rescue or water rescues due to the abundance of outdoor enthusiasts who flock to the area’s nearby mountains and Lake Utah year-round. Furthermore, as more jurisdictions in Utah and across the country join FirstNet, Orem’s first responders will be guaranteed network seamless coverage and interoperable communication with agencies and jurisdictions, and across state borders without experiencing congested networks during large scale events like Summerfest . For Gary Giles, Chief of Police for the City of Orem, his experience communicating over FirstNet proved invaluable at Orem’s Summerfest, and he anticipates that the network will continue to bring countless benefits to area law enforcement and the larger public safety for years to come. “FirstNet is a game changer for the City of Orem and the region,” said Giles.